The hubby is out of town this weekend so I took the opportunity to joyride around the Iowa City area. I started out in Kalona, a historic town filled with tourists and the occasional Amish horse and buggy. I picked up some delectable-looking cinnamon rolls, a skein of alpaca yarn, and a bag of (squeaky) cheese curds. Whatever does one do with cheese curds, you might ask. Poutine is possibly the best thing that ever came out of Canada. It consists of a pile of french fries topped with fresh cheese curds and a brown gravy. While this may sound strange and even disgusting to those non-poutine connoisseurs, I can assure you, this dish is AMAZING. 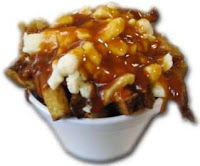 After vowing never to return to Quebec many years ago, I was at a loss as to how I would fulfill my poutine cravings. Eventually, Boston realized the brilliance of this dish and started serving it at selected restaurants. Harvest offers a decent option at the bar, consisting of hand cut french fries, cheese curd, bacon and chicken velouté. Before I left Boston, the Beehive opened up and served a "cheese and gravy frites" that was not exactly authentic, but still quite delicious. Given that the dining establishments in Iowa City are good, but not especially international (does Canadia count as "international"? ), I opted to make the fabulous poutine dish myself. From scratch. I forgot to pick up frozen french fries at the grocery store so I sufficed with oven roasted hand cut fries instead. The best poutine gravy comes powdered out of a can (double concentrated), but lacking this key ingredient I made a basic chicken gravy with vegetable demi-glace (similar to the one described by [No Recipe]). Pile on the baked french fries, crumble on some Amish squeaky cheese curds and drizzle on that gravy - ah...it's almost as good as the real thing! All I need is to serve it in a cheap styrofoam container with a plastic fork, hope for snow, and it will be like I'm right back in Quebec (minus the Québécois)!